The Key Play is a free, independent and credentialed online publication that covers Virginia Tech athletics. It's also the internet community where Hokies hang out outside of Lane Stadium. 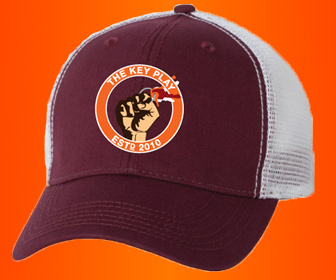 Thekeyplay.com was launched in March of 2010, and is now a property of Orange and Maroon Media, LLC. Orange and Maroon Media, LLC began conducting business in March 2013. The Key Play was issued press credentials by both Virginia Tech and the Atlantic Coast Conference in 2014. Thekeyplay.com features insightful coverage from unique voices, film analysis, advanced statistical analysis, up-to-date news, humor and interviews with high school recruits and coaches. Its articles, sophisticated software platform, and an intelligent community of members and commenters are what sets Thekeyplay.com apart from the competition. The Key Play publishes news and analysis daily. It also hosts a forum and community of thousands of Hokies who post, comment and vote on the day's Virginia Tech and sports topics. Articles published by The Key Play have been recognized and referenced by ESPN, Sports Illustrated, The New York Times, USA Today, SB Nation and other media outlets. Businesses can support The Key Play by purchasing a sponsorship. Individuals can make a donation via PayPal. As far as my eyes are concerned, maroon and orange are the two most beautiful colors in the world. I love, to the point of an unhealthy obsession, Virginia Tech football. I also enjoy RAILS from TOTS and the No. 5 from Sub Station II. Alex is a 2014 communication graduate that is deep in denial that he's no longer an undergrad. He covers recruiting and the Virginia Tech football beat for The Key Play. Born in Pittsburgh, but raised in Northern Virginia, he's currently living in Charlottesville, working as a producer for the morning shows at the local NBC station and trying not to despise all the UVa grads around him too much. His proudest achievement at Tech remains the fact that the bouncers at Sharkey's didn't ID him for almost all of his senior year. Jonathan French develops game film reviews and recruit analysis for The Key Play. After lettering in football for three years at Division III Emory & Henry under the tutelage of legendary Coach Fred Selfe, French left the world of football for the world of government relations. Despite this, film study remains his passion, and he works tirelessly to help fellow fans understand the game better. He currently resides in Northern Virginia where he works for a healthcare non-profit. When he isn't talking, about football, his passions include saltwater fishing and New York Rangers hockey. Hi, my name's Brian and I am attempting to write and talk about sports for a living. Joe brought me on when I was a junior at Tech and I've been writing open letters and providing #HOTTAKES ever since. Currently, I work as a producer for ESPN Blacksburg meaning that I've made the transition from student to townie (not trying to brag, but people at Sharkey's know me). Former VT Track star, class of 2009. After graduating, I developed an obsession for hype trailers as it was the only thing that could keep me sane during the off season. After deciding to make a few myself, I quickly became obsessed. I now have a media center in my house dedicated to recording, editing, and warehousing every game. GIFs, Memes, and Videos are what I do best. I currently reside in Minnesota with my wife and one-year-old daughter. Pierson joined The Key Play as a columnist in December, 2013. A 2007 graduate, he split his freshman year nights between Cowgill Hall and Thomas Hall (R.I.P. ), and still brags about how he and his buddies were regulars at the Rivermill before it was cool. He was lucky enough to marry a Blacksburg native, making visiting the in-laws a no-brainer (everybody wins! ), and he once stood in a customer service line with Michael Vick at the South Philly BestBuy the night before he re-ignited his career in support of an injured Donovan McNabb. After graduating from Tech, he moved to Philadelphia for graduate school, where he lived for the better part of the last 7 years. He and his wife recently relocated to Rhode Island, where he is a practicing architect specializing in historic preservation. Fun Fact: 30% of Americans think Rhode Island is an island...it's not. #TeamPie. A 2002 graduate from Pamplin in BIT. Denied my shot at football glory due to the coaching staff's fear of unleashing a Fuller upon a college football field with no way of knowing the level of havoc it would wreak on opponents. Luckily, Vincent and the younger boys were deemed as acceptable risks. Currently spending my days doing mild-mannered data analysis work and my weekends smoking pork butts like Kyle Fuller smoked Vad Lee. #TeamVinegarSauce. #TeamIceCream. No, I am not Austin Fuller. Hey everyone! My name is Jeff Beyer, former QB at VT (2006-2009, depending on the year, you'd see me wearing No. 15 or 16). I was the one with the headset on the sideline relaying the play calls in to the QB (either Sean Glennon, Tyrod Taylor, Cory Holt or Ju Ju Clayton). When Joe asked me to contribute to The Key Play, I couldn't have been more excited. Even though I live on the other side of the country, Hokie football is always the most important part of my fall Saturdays, so being able to share my thoughts on the web beats trying to convince anyone out here in Oregon to listen. I hope you guys enjoy reading what I have to say. After attending a small, private Division III engineering school for four years whose football team's stadium, attendance, and quality were all a step down from my high school in Georgia, I needed a grad school that would give me a real football experience...thus I found myself at Virginia Tech for a graduate degree in Statistics in 2002 and 2003. My favorite game experiences as a student were from 2003. First we had a visit from Texas A&M, and a hurricane was coming so college football games were being cancelled all over the mid-Atlantic but VT decided not to cancel. A friend and I walked to the stadium in pouring rain that never let up and watched us dominate them, running 47 times and throwing 13. A few weeks later we were upset by West Virginia, dropping us from #3 to #10. A week later I walked from Foxridge to the stadium to tailgate before #2 Miami, and on the way we asked a random guy what the score would be...he replied with something crazy like 40-7 Hokies. A few hours later VT's defensive line destroyed Miami en route to a 31-7 win in a stadium that's louder than any other I've ever heard. Mark is a 2011 and 2013 graduate of Virginia Tech, earning a bachelor's and a master's degree in Mechanical Engineering. During his time at Virginia Tech he also photographed for the student newspaper, The Collegiate Times, where he won several Virginia Press Association awards for sports photography. He now works in Blacksburg and is lucky enough to still live within walking distance of Lane Stadium and the rest of campus.